Oral and facial clefts are among the most common and heartbreaking of birth defects. Clefts make feeding or even breathing difficult and can affect speech development. But there's one other profound effect: an “abnormal” face caused by a cleft can have devastating consequences for a person's self-image and social relationships. About 1 in 700 U.S. babies are born with some type of visible gap or “cleft.” It can occur in their upper lip, soft and hard palate, nose or occasionally extending to the cheek or eye region. We typically classify clefts as “unilateral” (affecting only one side of the face) or “bilateral” (affecting both sides).Â We're not completely sure on the root causes, but research so far has uncovered links with the mother's possible exposure to toxic substances, nutrient or vitamin deficiencies, or infections during fetal development. Taking steps during pregnancy to minimize these exposures is certainly helpful. But what can be done for children born with a cleft? A great deal, thanks to the development of surgical repair techniques over the last century. The surgical approach relies on the fact that the tissues required to repair the cleft already exist. They're simply distorted by the cleft break. Even so, the road to restoration is a long and arduous one. 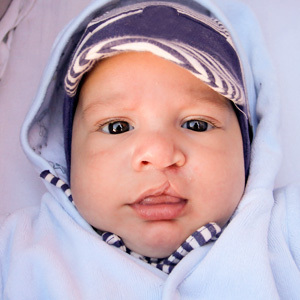 Lip repairs usually take place at 3-6 months of age; palate (roof of the mouth) clefts are undertaken at 6-12 months. As the child's jaw and mouth structure develops, further surgeries may be needed to match earlier repairs with development. Cleft repairs also require a team of specialists including a maxillofacial (oral) surgeon, orthodontist and general dentist. The latter plays an important role during the process, ensuring the child maintains good dental health through prevention and treatment of disease and dental work for at risk teeth. The road to a normal life is difficult — but well worth it. A repaired cleft vastly improves a child's health and well-being. Moreover, it restores to them something the rest of us might take for granted — a normal face and smile. If you would like more information on cleft defects and how to treat them, please contact us or schedule an appointment for a consultation. In October, the American Dental Hygienists’ Association sponsors National Dental Hygiene Month to remind everyone that having good oral health is directly related to practicing good oral hygiene at home. This includes brushing twice each day with fluoride toothpaste and flossing at least once per day. But sometimes we forget that dental hygiene applies not just to your teeth but also to anything you regularly wear in your mouth. This includes removable dentures (full or partial), clear aligners, nightguards, mouthguards and retainers. If you (or your kids, or seniors you know) wear any of these, please review the three appliance-care tips below. 1. CLEAN IT. Just like natural teeth, an oral appliance worn every day needs daily brushing. But toothpaste isn’t an appropriate cleanser for these devices; it’s too abrasive. The grainy particles it contains are great for scrubbing plaque and bits of food from the hard enamel coating of teeth—but they can actually leave little nicks in the plastic of your oral appliance, creating areas for bacteria to hide. This can eventually cause odors and stains. Instead, clean appliances with liquid dish soap or denture paste. Buy a separate brush for your appliance—don’t use the same one that you use on your teeth. It can be a very soft regular toothbrush, nail brush or denture brush. 2. RINSE IT. After cleaning your appliance, rinse it thoroughly. But don’t use hot water—and never boil an oral appliance to sterilize it! Your device was custom-made for your mouth, and it needs to fit precisely to do its job. Hot water can warp the appliance and change the fit, possibly rendering it useless or even harmful. For example, a warped orthodontic aligner might not move teeth into the correct position. Remember: the goal is to kill bacteria, not your appliance! 3. STORE IT. Keep your appliance in a safe place—away from curious pets and toddlers. When you are not wearing it or cleaning it, your device should be packed away in its case or soaking overnight in water or a cleaning solution according to your original instructions. Sometimes it seems that appearances count for everything—especially in Hollywood. But just recently, Lonnie Chaviz, the 10-year-old actor who plays young Randall on the hit TV show This Is Us, delivered a powerful message about accepting differences in body image. And the whole issue was triggered by negative social media comments about his smile. 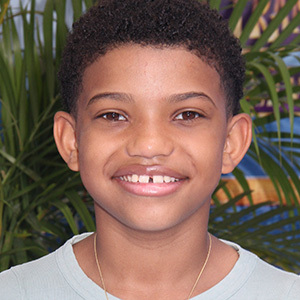 Lonnie has a noticeable diastema—that is, a gap between his two front teeth; this condition is commonly seen in children, but is less common in adults. There are plenty of celebrities who aren’t bothered by the excess space between their front teeth, such as Michael Strahan, Lauren Hutton and Vanessa Paradis. However, there are also many people who choose to close the gap for cosmetic or functional reasons. Lonnie is raising an important point: Making fun of how someone looks shows a terrible lack of compassion. Besides, each person’s smile is uniquely their own, and getting it “fixed” is a matter of personal choice. It’s true that in most circumstances, if the gap between the front teeth doesn’t shrink as you age and you decide you want to close it, orthodontic appliances like braces can do the job. Sometimes, a too-big gap can make it more difficult to eat and to pronounce some words. In other situations, it’s simply a question of aesthetics—some like it; others would prefer to live without it. There’s a flip side to this issue as well. When teeth need to be replaced, many people opt to have their smile restored just the way it was, rather than in some “ideal” manner. That could mean that their dentures are specially fabricated with a space between the front teeth, or the crowns of their dental implants are spaced farther apart than they normally would be. For these folks, the “imperfection” is so much a part of their unique identity that changing it just seems wrong. So if you’re satisfied with the way your smile looks, all you need to do is keep up with daily brushing and flossing, and come in for regular checkups and cleanings to keep it healthy and bright. If you’re unsatisfied, ask us how we could help make it better. And if you need tooth replacement, be sure to talk to us about all of your options—teeth that are regular and “Hollywood white;” teeth that are natural-looking, with minor variations in color and spacing; and teeth that look just like the smile you’ve always had. Willie Wonka's Chocolate Factory Was Not So Sweet to Cast's Teeth! Here is How You can Improve Your Wedding Day Smile! Baseball's Francisco Lindor Shines as "Mr. Smile"
Jamie Foxx Chips a Tooth - This Time by Accident! Actor David Ramsey Says: Don't Forget to Floss! America's (Dentists) Got Talent - for Fixing Damaged or Missing Teeth! Even Celebrities Like Jennifer Lawrence Aren't Immune From Bad Breath! Is Laser Treatment a Good Option for Controlling Gum Disease?